No one customer accounts for more than five percent of the business at Stainless Works, Chagrin Falls, OH, and that’s exactly how owner Ron Fuller likes it. The former high school industrial-arts teacher and owner of an automotive-restoration company acquired Stainless Works in 1995. Since then he’s successfully expanded the business from strictly fabricating stainless-steel exhaust systems for performance vehicles into a fully functional tube- and sheet-fabrication job shop. Most of the production at Stainless Works involves fabricating high-performance stainless-steel automotive exhaust systems. Manual gas-tungsten-arc welding assembles laser-cut flanges and bent tube. “Stainless is in our name, but we fabricate—laser-cut, form and weld—everything including mild steel, aluminum and titanium,” Fuller says. Some 75 percent of the material moving through the 50,000-sq.-ft. 42-employee shop falls under the exhaust column of Fuller’s spreadsheet, the rest on the job-shop side. That will be a difficult target to hit, since the performance-vehicle exhaust business grows an average of 35 percent per year. The shop processes $500,000 worth of 1.5- to 3.5-in.-dia. 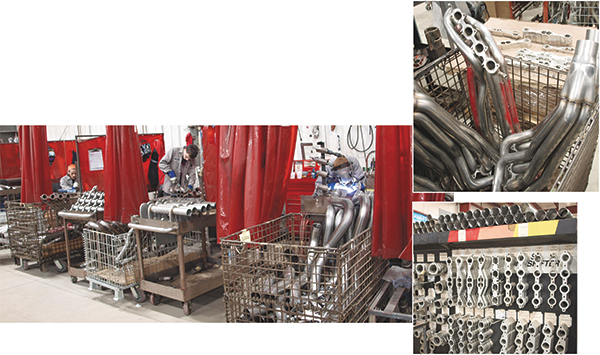 tube per year, specializing in headers and exhausts, and associated components such as hangers and clamps. But Fuller credits his optimistic outlook for the job-shop side of his business with a big boost in marketing and sales efforts. “It also doesn’t hurt that we’ve invested heavily in new technology,” notes Fuller. At the top of the new-acquisition list is a Trumpf TruLaser 3030 laser-cutting machine with a TruFlow 6000 6-kW CO2 resonator and 5- by 10-ft. worktable. 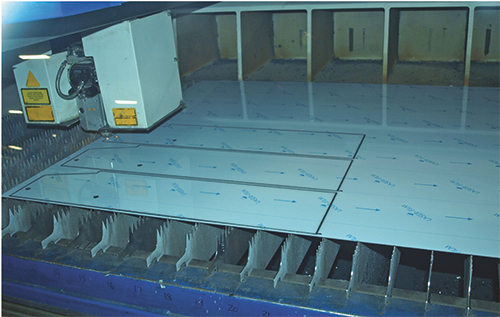 To enable fully automated laser cutting, including lights-out operation, Fuller equipped the machine with Trumpf’s LiftMaster Compact load/ unload system (boasting a 65-sec. material-exchange time), along with the TruStore material-storage tower (15 compartments and maximum load of 3000 kg per compartment). “And, we gave the new machine some extra juice by adding Trumpf’s RotoLas tube-cutting attachment,” notes Fuller, “to help differentiate ourselves in the market and stay one step ahead.” RotoLas converts a 2D flat-material cutting table into a 3D tube cutter for profiling round and square tube, and for making through-holes and slot cuts. 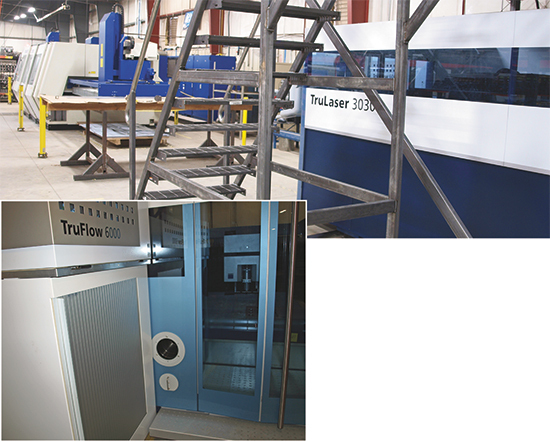 Stainless Works’ 50,000-sq.-ft. shop houses two Trumpf laser-cutting machines—a Trumatic L2510 with 2-kW resonator (background), and a new TruLaser 3030 with a 5- by 10-ft. table and 6-kW laser. Added as an option to the TruLaser 3030 is Trumpf’s RotoLas feature that enables the machine to laser-cut tube sections fed manually into a three-jaw chuck (bottom). Fuller moved his exhaust-system business, built primarily on tube fabrication processes such as saw-cutting, bending and welding, into laser cutting in 2003. Welcome a Trumpf Trumatic L2530 machine with 3200-W laser and 4- by 8-ft. cutting table, with pallet changer. It immediately took on all of the firm’s exhaust-system flange-cutting requirements, improving speed and edge quality when cutting flanges from 3⁄8-in. stainless-steel plate. “We cut thousands of flanges per month,” notes Fuller. Yet, flange cutting consumed only about half of the 2530’s capacity, leading Fuller to market laser time to local fabricators, stampers and equipment OEMs. Next up was a Trumpf Trumatic L2510 cutting machine with load/unload capabilities, to enable lights-out cutting. Fuller added the machine—4- by 10-ft. table, 2-kW CO2 laser—in 2007 specifically to take on longer runs of thinner material. “That became necessary because we started to move into heavier-gauge work processed on the 2530,” Fuller says. Customers included equipment OEMs serving the energy industry, such as builders of coal-handling equipment. New Laser = New Opportunities; Fiber Next? “With the addition of the new 6-kW machine,” continues Fuller, “we’ll likely replace the L2510 in a few years with a fiber-laser cutting machine, to handle work 3⁄16 in. and thinner. We just have to build more volume in that area.” Fuller’s new machine adds plenty of sheet- and plate-cutting capacity to the shop, since, as he notes, it can carve up 3⁄8-in. 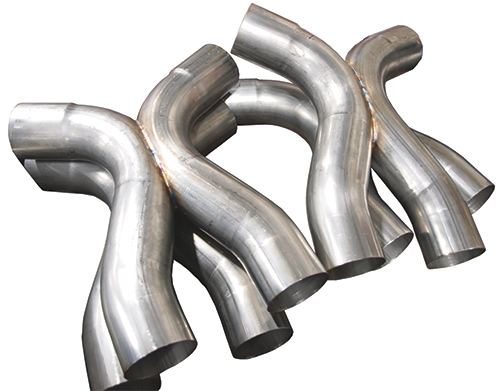 stainless-steel exhaust flanges at 60 in./min., compared to 20 in./min. on the 2530. Noting that he opted for nearly every “bell and whistle” available on the 3030, Fuller describes the benefits of one particular new machine feature: Trumpf’s CoolLine water-mist applicator. Located in a specially designed cutting head, the CoolLine nozzle directs a water mist around the laser beam as it reaches the workpiece. The water mist reduces heat transfer to the cutting zone, enabling tighter corner radii and the cutting of smaller hole diameters than would otherwise be possible. Also, according to Trumpf literature, keeping the cut zone cooler allows fabricators to tighten up their nests in thick material. Optimizing material utilization and reducing scrap. We watched the Trumatic L2510 cut PVC-coated stainless steel, first vaporizing a 3⁄16-in.-wide strip of the coating a from the cut line. This eliminates any fuzz on the back of the cut edge as a result of the PVC driving down through the cut, and causes the PVC to adhere better to the edge of the part so it won’t peel a during press-brake bending. We spied the 2510 cutting PVC-coated stock, a common occurrence at Stainless Works. Fuller’s operator has perfected the art of vaporizing the coating around the cut line—a 1⁄16-in.-wide path or so—to optimize cut-edge quality. “He powers down the beam a bit and raises the standoff distance,” explains Fuller, “to remove the coating prior to cutting. While this increases production time by about 20 percent, it eliminates any fuzz on the back of the cut edge that we might otherwise see, as a result of the PVC driving down through the cut. Fuller’s added two Trumpf CNC press brakes to the shop in recent years, to become a full-service contract manufacturer. He’s also equipped four manual arc-welding booths with the latest Lincoln gas-tungsten-arc-welding equipment, and purchased a self-contained Panasonic robotic gas-metal-arc-welding cell. Additional processes offered include assembly, finishing and machining. Customers come from numerous industries including automotive, computer, electrical, heavy equipment and restaurant equipment. Such dramatic growth, encompassing more than 2000 exhaust products and hundreds more products on the custom-fab side, has led Fuller to upgrade his shop-management software. The goal: increased visibility into the shop floor, more accurate inventory control and purchasing and streamlined production. Paperless flow also is on the wish list. An unusual application for the 2D Trumatic L2510: carving flat-shaped cutouts in exhaust tubing to enable welding together these X-pipes. “We fabricated a fixture to hold the pipes perpendicular to the laser beam, and the laser cuts the pipes like they’re flat stock,” says Stainless Works owner Ron Fuller. What’s next on Fuller’s investment agenda?